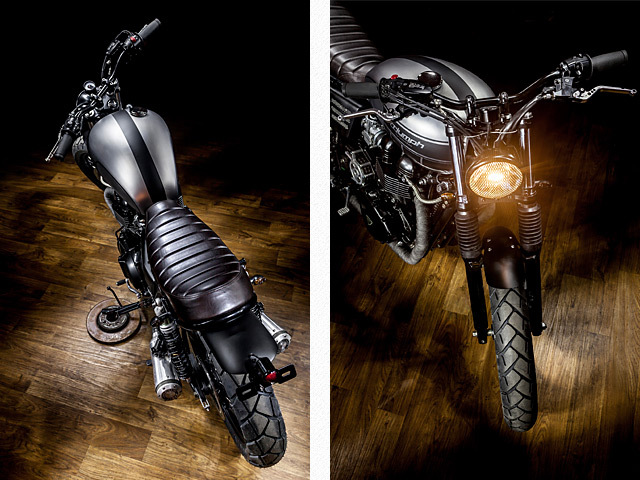 Spain’s Macco Motors are building a large following with their clean and classic builds of everything from Harley V-Twins to little European 2 Stroke smokeys. 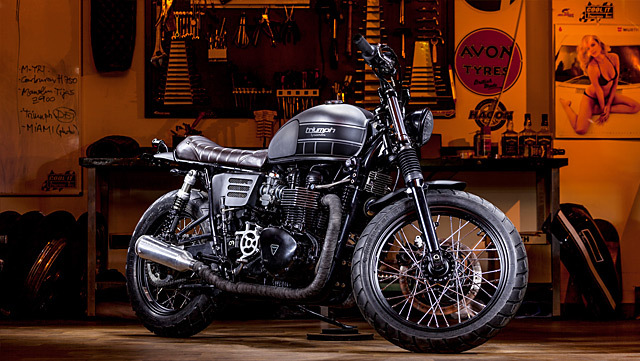 But it is there Triumph Bonneville builds that are gaining fans from all corners of the globe and it was this that brought to them Jarlath, a customer from Belfast in Northern Ireland who’d seen the Macco Bonneville’s and had to have one of his own. Who could blame him, Macco Motors build many of the parts themselves, they do everything in-house and all of their builds are first class. Road racing is arguably the national sport in Northern Ireland but with its iffy weather Jarlath wanted a machine that was more than capable in all conditions; Macco delivered exactly that and more, a 2010 Triumph Bonneville delivered across the Irish sea sporting the most fitting of names, “Pilgrim”. While Jarlath was obviously more than keen on the look that Macco Motors create with their Triumph builds he was after a more “Rock n Roll” style for the paint on the gas tank and the boys were more than willing to oblige. Inspired by the Yamaha graphics schemes of old the decision was made to go with a raw metal finish with black paint work. 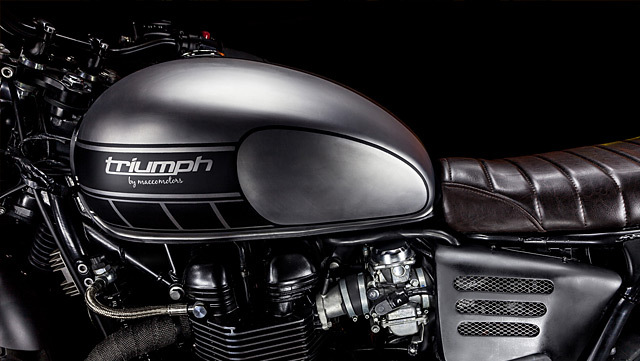 The matte black is used to shadow the revealed Triumph logo with the Macco Motors graphic featured just below and a racing stripe over the top. The rear subframe has been modified allowing for the fitment of the beautiful dark leather seat by Macco with the rear hoop following its profile for a factory like fit. 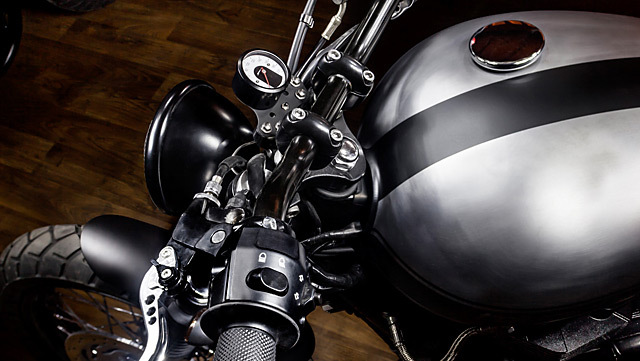 The last of the tins are courtesy of fenders made by the boys from fibreglass, the factory items are ditched and the front fender is a bobbed style item finished in matte black that utilise the factory mounts. Out back the one-off fender also features the matte black used throughout the build but is mounted to the new subframe and while only just protruding at the rear is carried all the way forward like a standard item for maximum engine protection. Mounted to the rear fender is an old school tail light with plate holder and new indicators are mounted just behind the shock mounts. Out front a Bates style headlight in a smaller diameter replaces the stock unit for a more focused look and keeping the police happy are front indicators that are fork mounted. Powering Pilgrim around the streets of Belfast is the classic 865cc parallel Triumph twin with its effortless torque across the rev range providing the perfect performance for an all-purpose machine. To extract some extra power and give one hell of an exhaust note the thumping twin is fitted with tuneable SuperTrapp mufflers in stainless steel with the pipes completely heat wrapped. Allowing the inlet side to breathe the crisp Irish air is Macco’s own custom side covers made from fibreglass that feature mesh covered vents. Popular Triumph mods of late that are utilised on all Macco builds are carried over to Jarlath’s bike with the relocation of the regulator rectifier and ignition. Final drive is improved with new sprockets, the front exposed with an LSL cover and a new uprated chain. 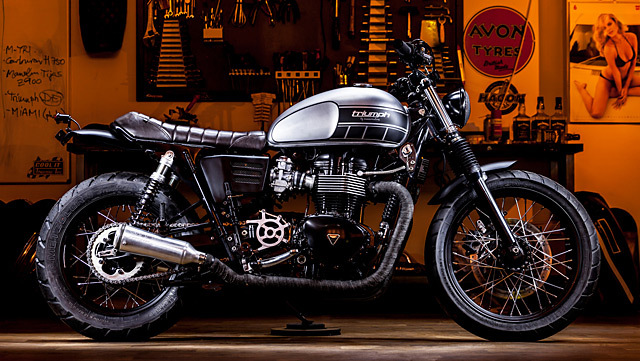 The chassis and suspension on the modern Bonneville while based very much on the layout of the classic machine performs exceptionally well from the factory. Twin rear shocks, conventional telescopic forks and a steel frame offer consistent turn in and great road holding but everything can be improved upon and Macco did just that. The front 41mm forks have been upgraded with progressive rate springs from Hagon that increase feel and reduce dive under braking. Out back the classic twin shock system remains in place but with the addition of the industry leading Ohlins fully adjustable shocks with progressive springs that feature height adjustment. For absolute versatility the finally road holding feature comes from the fitment of Metzeler Tourance tyres with a meaty 140 section out back. 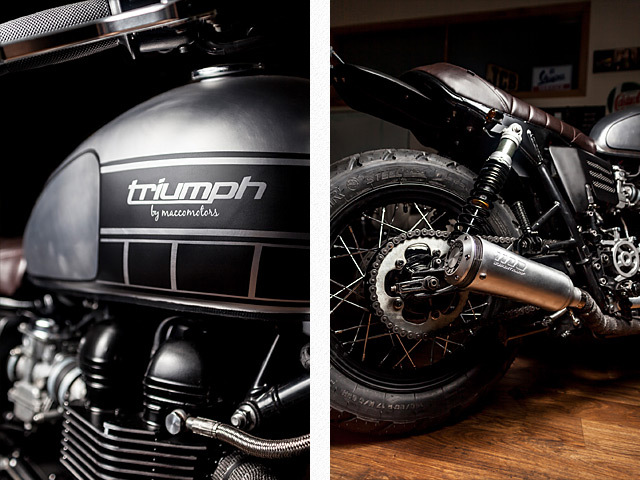 Jarlath muscles the Triumph around the streets of Belfast with his hands on a set of Biltwell grips that are fitted to the tracker style Biltwell bars that are a common feature on Macco Motors builds. Allowing for more aggressive riding and two finger braking and clutch operation are a set of Racing Style levers that also have built-in adjustability. Cleaning up the front end even further Macco ditched the standard instruments and fitted a small Motogadget speedo that works in conjunction with the ingenious m-TRI signal adapter that takes control of all information on lights, indicators, speed, water temp and a whole host of idiot lights and sends the signals to the digital speedo. 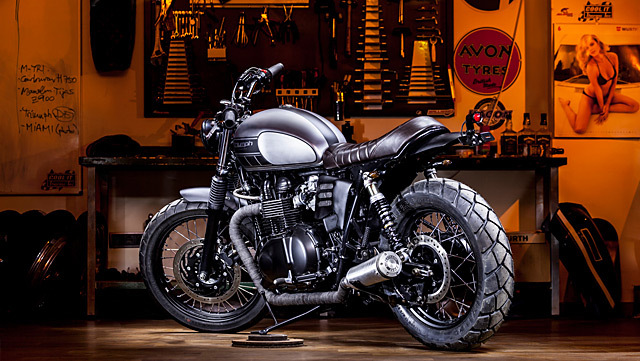 Macco Motors love to build any bike they can get their hands on and enjoy the challenge of tackling a project from a brand they’ve never worked on before. 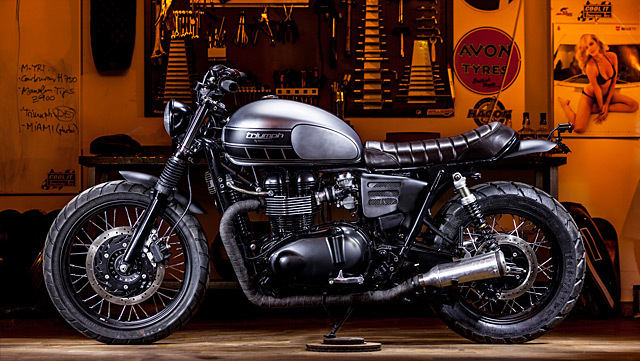 But so long as they keep churning out picture perfect Bonneville’s they can expect more international calls placing orders no matter the wait and that is one of the highest compliments any builder can receive.